A huge Sky Atlantic and Amazon Video Production featuring many of British tv stars. It's an epic historic war show set in In 43 AD. It's about the fight against the Roman army and the local warrior rulers of Celtic Britannia. Where can you stream Britannia? On 2018-01-18 Drama/Sci-Fi & Fantasy TV Series Britannia first aired on Amazon. 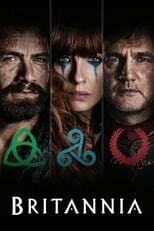 Written and created by Jez Butterworth & Tom Butterworth, and produced by Neal Street Productions & Sky, Britannia will return and was last broadcasted on 2018-01-18.